Barber Surgeons Hall, Newcastle. 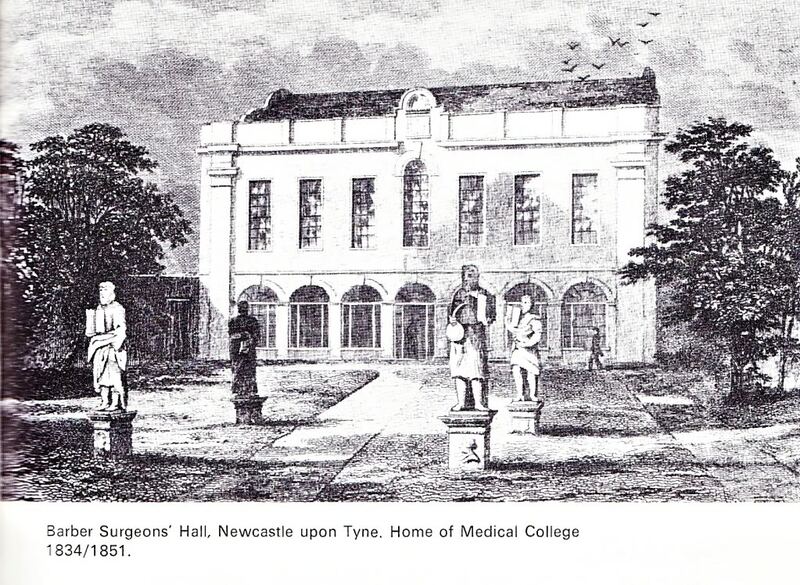 The site of the many dissections of criminals and later the first home of the Newcastle Medical College that would become Newcastle University. In last weeks blog, I nodded to a dilemma I am currently having writing my thesis, but refused to address it, saying “I don’t have 4,000 words here to explain why.” Since writing that, two thoughts crossed my mind. Firstly, I shouldn’t patronise you (the reader) by thinking that you wouldn’t be interested in the more nuanced elements of my study and secondly, it will only be 4,000 words if i waffle. So, here goes nothing (you’ve been warned!). The Issue: In my supervisor’s excellent book (co-written with Gwenda Morgan), the following assertion is made. 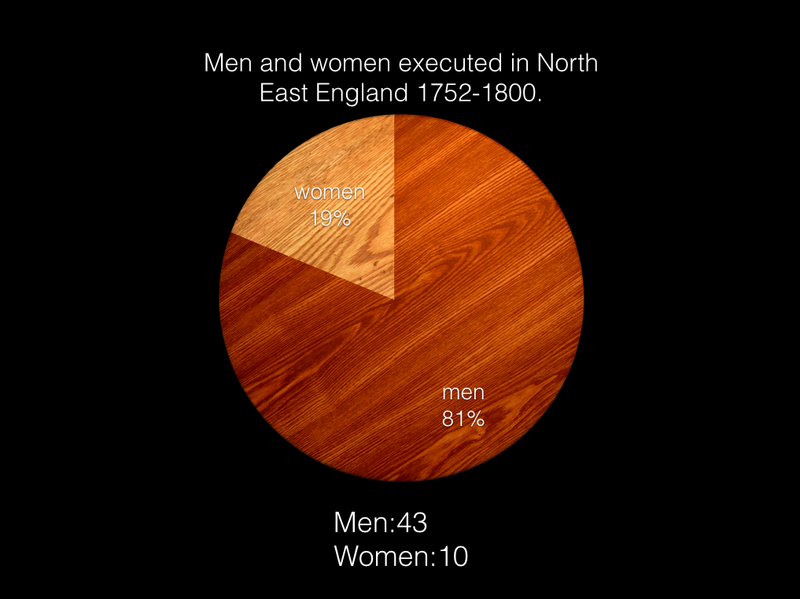 In the North East women were far more likely than men to be dissected: half of the women executed in the region after 1750, compared with less than an eighth of the men. This is a striking divergence from the sensibility and propriety which seem to have shaped the decline of the other public punishments for women. The Dilemma: I disagree with this assertion based on the evidence I have found. That may not seem like too much of a dilemma, but if you’re saying something contrary to your supervisor and they’re an expert in the region, it is a dilemma (or at least in my head it is!). My Supervisor is great and probably won’t mind in the slightest. I will now attempt to succinctly explain my reasoning. At the heart of my disagreement is the 1752 Murder Act itself. This act introduced the additional punishments of dissection or gibbeting/hanging in chains for the ‘horrible crime of Murder.’ This caveat is key as the act was expressly to punish Murders and by and large there was very little exceptions made. In a recent national study of all post death sentencing in England and Wales (1752-1832) the following figures were produced. 1,151 offenders capitally convicted for killing offences. Their post-mortem sentences broke down as follows. This is actually a very small number and equates to fewer than two gibbetings a year across England and Wales, averaged through the period. 1). Between 1752-1832 Dissection was used exclusively to punish the crime of murder. 2). Hanging in Chains was used to punish both murder and, very occasionally, other crimes, but in all cases it was a male punishment. The reason these two points are essential to get across becomes more apparent when you look at the my figures for executions in the North East. Lets first look at the period covered by Rushton and Morgan’s (1750-1800). It is worth noting that I am using 1752-1800 as the Murder Act started in 1752 and no women were executed in the region between 1750-52. I have provided simple stats and accompanying pie charts for those who prefer their data visualised. These stats break down, by criminal charge, as follows. So, what do these sets of figures show us? Well the truth is they show us numerous interesting things, but for the purpose of this blog we will focus on two. 1). 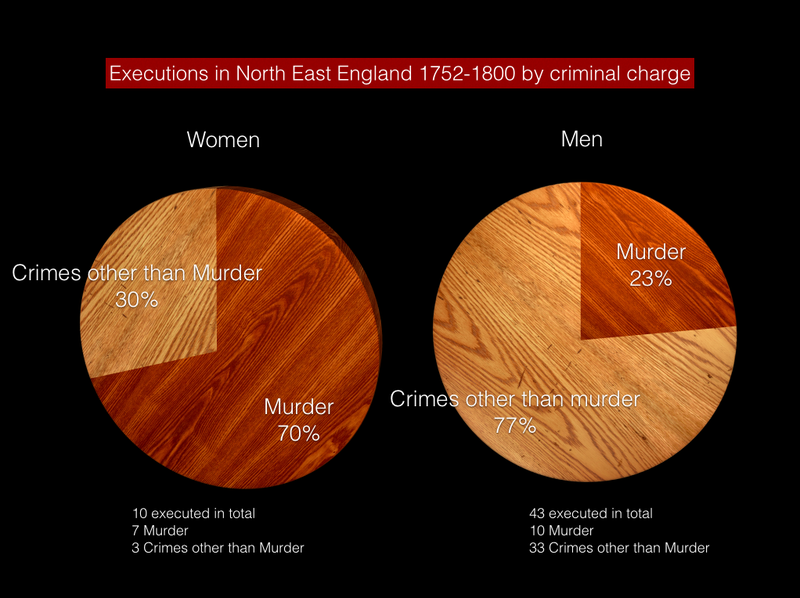 Far fewer women were executed than men in the North East between 1752-1800. 2). Of the women executed the vast majority were for the crime of murder, the almost exact opposite is true of the men. These two trends have been widely noted across various national studies of executions in this period, so fit in with broader trend. The hanging spectacle often provoked unease. Anxiety grew about extreme punishments for women who ‘by being the weaker body, are more liable to error, and less entitled to severity’. The reasons behind women being less likely to be charged and, in the worst cases, executed are multifarious and still widely debated, but the fact that they were far less likely to reach the dreaded gallows than their male counterparts is widely acknowledged. So, what does this show us? Lets return to the Murder Act of 1752. Under this legislation, the charge of murder, had to receive an additional post-mortem punishment. Now, given that 70% of the women that were executed in the region had been charged with Murder and, as we have already noted gibbetting was, although not expressly stated, an exclusively male punishment, all the women charged with murder were destined for the surgeon’s table. So, lets return to the original quote, that sparked this blog. Whilst this is in part true, it is not comparing like for like. 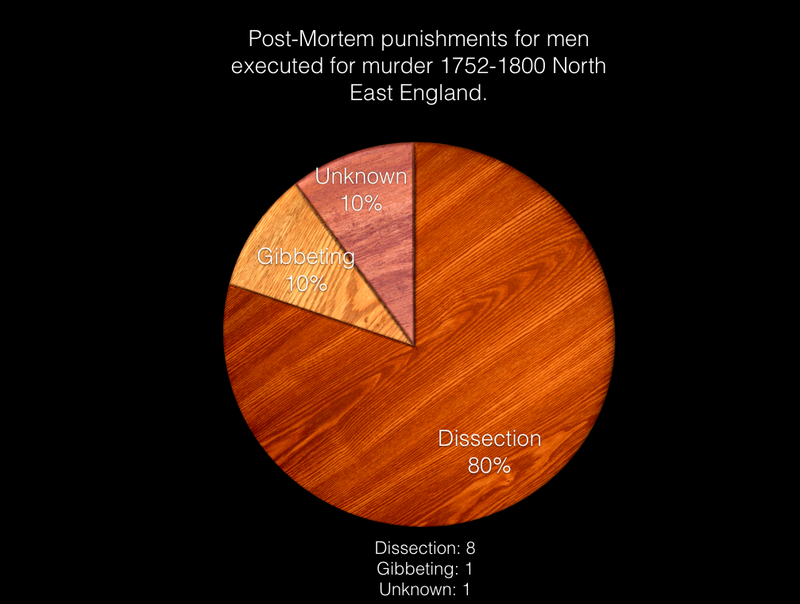 Women were more likely to be dissected than men, BUT only if you consider all cases of execution in the region. If we just look at the charges for murder the figures tell a very different story. Of the 10 men executed for murder between 1752-1800, my research in local papers and the National Archives has shown the following. 1 – Unknown. (This is Thomas Coulson who was executed in 1762 and I can find no record in the papers or in the Assize records detailing his post-mortem provision. However, given the nature of gibbets (huge structures on the landscape) and the infamy that surrounded them and has made them well documented to this day, it is safe to assume that he was not gibbeted and therefore suffered dissection. So, even if we discount Thomas Coulson we see that 80% of the men charged with murder were dissected, 90% if he is included. a striking divergence from the sensibility and propriety which seem to have shaped the decline of the other public punishments for women. Does this new evidence now show this assertion to be flawed. I think so and here’s why. The wider national trend of ‘sensibility and propriety’ that Rushton and Morgan found to be absent in the North East, can be seen in the refusal to gibbet women. Gibbeting, far more than dissection was a public spectacle, indeed an unavoidable one. Although access was permitted to see dissections and there were initially periods where the public were admitted to witness the body for free, all displays of dissecting were charged for and attended, by and large, by apprentice surgeons and ‘gentlemen’. In the instances i have found of these events, particularly in Newcastle, lectures appear to be attended by roughly 50 people (split evenly between the ‘gentlemen’ and apprentice surgeons) and last for two weeks. Compare this to a gibbet, which was a roughly 30ft high structure, placed at the location of the crime or nearby and known to contain the bodies of their victims for, in some cases, upwards of 7 years. These structures were unavoidable and the site of a woman gibbeted would have been the cause of great public consternation. To conclude, I must acknowledge that there is a vital piece of evidence missing in any conjectures made about post death sentences, namely the reason behind the decisions made. Commenting on their study of all post death sentencing in England and Wales between 1752-1832, Tarlow and Dyndor acknowledged this problem. We have been unable to determine what factors militated towards dissection rather than hanging in chains or vice versa. It is rare to find any discussion or reason behind the sentencing. However, it would seem safe to assert, that for the crime of Murder, women were no more likely to be dissected than men. If we can assume anything it is that both were almost invariably destined for the surgeon’s slab. Phew! Am I a doctor now! (I even managed it all in 1,400 words, that’s 2,600 less than I predicted). I look forward to my readers/supervisor now shooting my arguments down in flames. It appears that TV programmes are like buses, after waiting ages for one you want, two come at once. The first of these was This is England ’90. I am a huge fan of Shane Meadows and also of the rightfully renowned Warp Films and This is England is right up there with their finest work. It made the bizarre transition of starting life on the big screen and then becoming a TV series and, in the decade since its first appearance, it has rarely put a foot wrong. So, I was incredibly excited about This is England ’90 this week. In the build up to the show I was remembering what happened to me in 1990. I was 6 years old and no doubt trepidatious about a second year at primary school, my highlight of the year was probably some personal milestone like learning to tie my shoelaces. In short, mine was a life far removed from the all night raves, casual drug taking , Stone Roses gigs and Madchester scene, of Meadows’ 90’s England. However, I still (as with all Shane Meadows’ work) felt a deep sense of connection and love for the characters in this latest series. It wasn’t quite up there with earlier series, but it’s a first episode and will grow with time, but if you’ve never seen it before then I suggest you start with the film – you don’t know what you’re missing. How does a PhD student studying execution 40 hours a week relax? Simple, by watching harrowing documentaries about Death Row. I stumbled across Werner Herzog’s “On Death Row” series this week, in which he gained exclusive access to a number of different convicted criminals facing death. In these remarkable interviews, Herzog lets each interviewee explain their crime (or as if often the case claim their innocence) and then supplements the interviews with facts from the case and additional interviews with family members or law officials involved. The series has Herzog’s trademark pared back style and is sympathetically produced, without being overly preachy (Herzog acknowledges his opposition to the death penalty at the top of the documentary). What I found particularly interesting in Herzog’s interviews was how often the convicted person claimed their innocence of the crime, or at least the parts of the crime that meant they would face execution. It put me in mind of this scene from Shawshank Redemption.